The Russian Navy will arm its cruise missile subs with new weapons systems. The Russian Navy will arm its upgraded Project 949A Oscar II-class nuclear-powered guided missile submarines (SSGN) with 3M-54 Kalibr cruise missiles, Russia’s Deputy Defense Minister Yuri Borisov said on March 6. 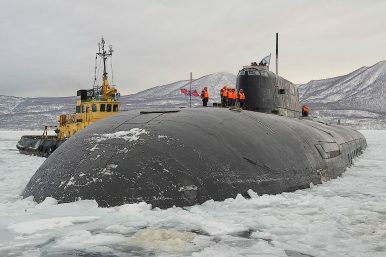 Two Project 949A SSGNs are currently being retrofitted as part of a life extension program at the Zvezda shipyard in the Russian Far East, which is supposed to expand the subs’ service life by 15 to 20 years. “The Zvezda shipyard is carrying out profound modernization of Project 949A nuclear submarines, including the replacement of armament with the Kalibr missile complex and also the replacement of navigation, life support, and other systems,” Borisov told TASS news agency this week. Project 949A subs, built between 1985 and 1999, are primarily designed to attack U.S. carrier strike groups and coastal targets in the event of a conflict. They are the largest cruise missile subs currently in service in Russia. The Russian Navy is currently operating two Project 949A subs in its Northern Fleet and five with the Pacific Fleet. Displacing around 24,000 tons (submerged), Project 949A subs can carry up to 24 P-700 Granit (NATO designation: SS-19 Shipwreck) anti-ship cruise missiles. Following their mid-life upgrades, the submarines will be refitted with 3M-54 Kalibr (NATO designation: SS-N-27A Sizzler) anti-ship cruise missiles. “The 3M-54 Kalibr is a supersonic cruise missile available in land-attack, anti-ship, and anti-submarine variants. It is specifically designed to evade active air defenses and electronic countermeasures,” I explained elsewhere. The submarine-launched anti-ship version of the missile, dubbed 3M54K, has an estimated range of 270 to 410 miles. There are over a dozen variants in the Kalibr missile family (some nuclear-capable), and the subs could also likely be equipped with a land-attack version of the weapon system, dubbed Kalibr 3M14T and 3M14K (NATO designation: SS-N-30A), with a substantially larger range estimated between 1,000 and 1,500 miles. In December 2015, a Russian improved Project 636.3 Kilo-class (aka Vashavyanka-class) diesel-electric submarine launched four such Kalibr land attack cruise missiles from an underwater position in the Mediterranean against targets near the city of Raqqa in Syria. It is still unclear how many Project 949A submarines will be upgraded in the coming years. The Russian Navy officially has eight submarines of the class in service at the moment. In 2015, it was announced that all eight will be upgraded for an estimated $180 million per boat. However, this number was later reduced to two: The Irkutsk and the Chelyabinsk. The status of a third Project 949A submarine, the Oryol, currently being retrofitted at the Zvezdochka shipyard in the Arkhangelsk region in Northern Russia, remains unknown. As I reported previously, the submarine caught fire during maintenance work at a dry dock in April 2015. The boat was supposed to rejoin its submarine squadron by the end of 2016, but this appears to not have been the case. Four nuclear-powered subs are expected to be upgraded with new weapons systems by 2021.